The Great Bear Lake is located in the Northwest Territories of Canada. It is the largest lake inside the Canadian borders. It is also the fourth largest lake in North America. It covers a total area of 12,275 square miles. It was discovered by the North West Company before 1800. This lake consists of five separate arms which are Dease, McTavish, McVicar, Keith and Smith. It is drained to the west by the Great Bear River. It remains frozen for eight months of the year. Sir John Franklin was the first one to explore Great Bear Lake in 1825. The average depth of the lake is 71.7 meters and the maximum depth is 446 meters. The native flora and fauna of the lake are adapted to the cold climate of the habitat. This lake was formed and modified by the advances and retreats of the Pleistocene glaciers. All the five arms of the lake have unique fish species because these fishes do not migrate. A federal government fisheries survey of Great Bear Lake described the lake as a “biological desert”. The total shoreline of the Great Bear Lake measures 2,719 kilometers in length. At its northern extreme, the lake is intersected by the Arctic Circle. The area around the lake has long, cold winters, and short, cool summers. The north shore connects Great Bear Lake to important areas for hunting caribou and muskoxen. Declan, Tobin. " 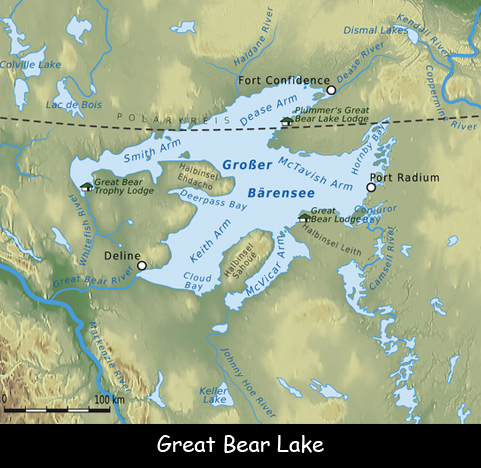 All about Great Bear Lake for Kids ." Easy Science for Kids, Apr 2019. Web. 24 Apr 2019. < https://easyscienceforkids.com/great-bear-lake/ >.